Toddler sleep is tough enough….but add in early rising on top of nighttime waking and short naps? That is a problem indeed! Early waking can be a particularly tough problem to tackle with toddlers, since they’re so much more mobile and (and often more strong-willed) than babies. While an early-rising baby will cry, an early-rising toddler will climb out of bed, walk into your room, and insist that it’s time to get up! Clearly, then, the problem of toddlers who are waking too early is one that needs fixing, and fast! Read on for our 5 sure-fire tips. What Is “Waking Up Too Early” For A Toddler, Anyway? Now remember that ‘early’ is a relative term – for some parents, a 5:00 wake-up time is ideal, while for others, anything before 8:30 is considered “way too early”! That’s why it’s a good idea to establish an objective “waking too early” standard against which you can judge your situation. As a rule of thumb, if your toddler’s wake-up time is after 6 a.m. and he or she is waking up fairly happy and refreshed, then you likely don’t have an early waking problem on your hands. A wake-up time of 6:00 or later is reasonable and developmentally-appropriate for most babies and toddlers, provided they are getting adequate nighttime and nap time sleep. That said, if your child is waking before 6 a.m., and/or seems cranky and tired first thing in the morning, then you likely do have an early-rising issue on your hands. Why Is Your Toddler Waking Up Too Early? Your toddler may wake too early on occasion due to a variety of different factors, including…. ….traveling (and sleeping in an unfamiliar setting). ….transitioning to a new toddler bed. Remember that occasional and intermittent early waking is nothing to worry much about. If you can trace the cause of your toddler’s early waking to something temporary, like one of the factors listed above, then simply work on getting back on track as soon as you can. However, if your baby regularly wakes too early, then it’s likely you have a scheduling problem to solve. Nap Timing: It may be that either the timing of your child’s naps are off, or the length of the naps themselves are off. For instance, the transitions from two naps to one, and then from one nap to none, tend to be really tough and can lead to a host of sleep issues, including early rising. Bedtime Timing: We preach often about putting babies to bed early, because sleep begets sleep. But older toddlers who still take an afternoon nap may actually benefit from a later bedtime. If you put a toddler to bed early, he may not be tired enough for sleep and may instead bounce around his bed for hours before he finally falls asleep. 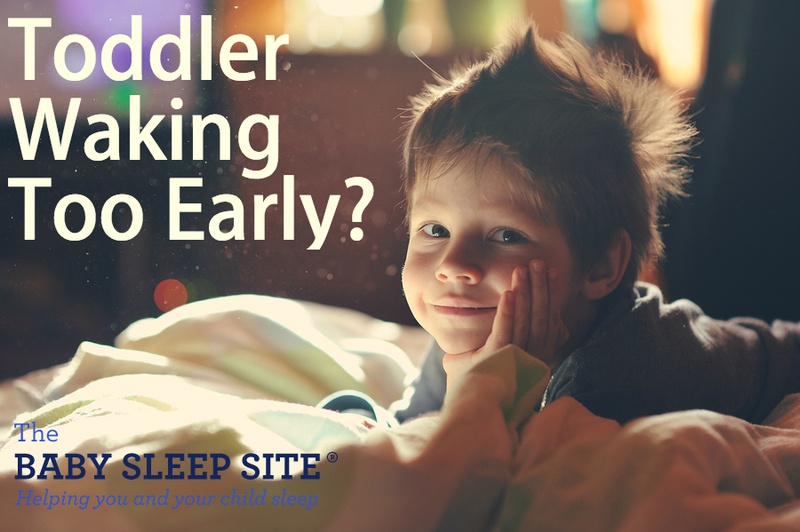 So your toddler is waking too early. At this point, you probably know what’s causing the early waking….but how are you supposed to fix it? Good question! First, you’ll want to start treating your toddler’s early-morning wake-up calls as night wakings, and not “start-of-the-morning” wakings. This can be tough, especially if your toddler is able to get out of bed and wander out of her room. It’s fine to get up and offer comfort, or to get up and return your toddler to bed, but try not to get your toddler up for the day. If you do, you’re merely reinforcing that this early-morning waking is fine and normal and part of the regular routine. If, after a week of treating early wakings as night wakings, your child is still waking too early, then begin making schedule adjustments. Do you need to work in an extra nap during the day? Do you need to shift the timing of any naps, so that your toddler has less awake time during the day? Do you need to move bedtime earlier, or possibly later? Do you need to offer a bedtime snack? Gradually make these schedule adjustments, while still treating any early wakings as night wakings. Generally, following these steps will resolve most early waking problems. If you’re still struggling, however, you may need a more expert approach to solving your problem. For more early-waking help, check out our members-only ebook, Shift Your Child’s Schedule. It includes helpful tips designed to shift your child’s schedule either forward or backward so as to fix early- or late-waking problems. Members enjoy unlimited access to this e-book at no additional cost. Is your toddler waking up too early? Scroll down to share your tips, and to hear from other parents just like you! Help my 20 month old has been consistently waking up between 5 and 5:30 for months. We’ve tried letting her cry, feeding her but nothing seems to work. She takes one nap a day after lunch, and puts herself to sleep and goes to bed quickly. If you have any questions please feel free to contact us directly at contact@babysleepsite.com. Hang in there! I hope this helps point you in the right direction! Hi, I’m wondering if you could provide any insight. My three year old has been waking up at 6 after less than 9.5 hours of nighttime sleep (she usually falls asleep at 8:30 even if her bedtime is at 7:30). She’s obviously not getting enough rest bc She is incredibly grumpy in the morning. She takes a 1 hour nap in the afternoon. We keep her room very dark and have a sound machine. She usually wakes up after 7, but in the past week she has been waking up early. She doesn’t climb out of her crib, so that’s good, but we can’t get her until after 7 since we’re getting ready for work. Is this just a regression or phase, or do we need to make a change? Hi @Essie – Thank you for writing to us about your three year old! I am sorry to hear that she is not getting enough sleep right now! We know how brutal those early morning wakings can be, and you certainly want to do what you can to have a well-rested and not grumpy girl in the morning! With older toddlers, it’s all about setting limits and being consistent, so keep offering that earlier bedtime, and giving her that chance to fall back to sleep in the morning as you have been! Hopefully it passes quickly! If you find that you would like more help, you may want to consider our 5 Step Toddler Ebook. Hi my 3 year old son keeps waking at 5pm. He is clearly still tired as he is rubbing his eyes and by 11/12 he’s is normally very tired. We no longer have naps so just have rest time for an hour the go to bed about 7.30pm. We have tried earlier bedtime and later bedtime but he will still wake up around 5/6am. My child is 2 yrs old and has been waking up between 4/5:00 every day this week. He also has gotten up in the middle of the night and whines a bit (Momma hold you). He goes down at 8 every night and has no issues going to sleep or fighting sleep at night or nap time. He is still in his crib with no issues. His nap is usually around 12:30 and he naps anywhere from 1.5-2 hours. Do we need to move up bedtime, shorten his nap?? Is this just a regression? His usual wake time is 6:15/6:30. Hopefully things smooth out quickly! Do please keep us in mind if you find that you would like some one-on-one help from an expert! My 17 month daughter has no problem being put to bed or fall asleep on her own. However, she wakes early from her nap and night sleep. Her nap is around 12:15 for 1.5 hrs. Her night sleep is from 7pm to 5:30am. Both sleep she will wake up and immediately throw her stuffie out of the crib and will cry until we decide to get her. How can I ger naps and night sleep longer? She is tired throughout the day and has lots of tantrums especially in the late afternoon. Hi @Adele – Thank you for writing to us! While your toddler’s total nap time is on the average scale, those early morning wake ups can be tough!! If she has not been doing this long, it may be a temporary regression, which will hopefully smooth out, as long as you are not encouraging it by getting her up consistently at the 5:30am hour. If she has been only sleeping for 10 hours at night for a while (more than a few weeks), and is clearly tired, you may want to try and add another quick nap in the schedule temporarily, just to get her a little more sleep. Again, those early morning wake ups are tough, and we recommend treating them as you would a middle of the night wake up, so that she knows it is still time to be asleep! We saw that our daughter had a 45 minute fuss, and if we left her alone she really would go back to sleep, and sleep for hours. Now I know why! Thank you. @Racial – We are glad the article was helpful! Thank you for stopping by! not like he has learned if wakes up early we come earlier. He takes one midday nap typically around noon and it lasts 1-2 hours. He is not necessarily cranky when first wakes but is definitely tired because he is having a lot more meltdowns during the day. We have tried earlier and later bedtimes and nothing seems to work. Any other ideas? Is he ready for one of those clocks where it turns green when okay to come out of bed? Would that maybe help at least with screaming? I would love for him to just sleep till 6 and not scream. We also have a 5 mo and I feel like my toddler’s screaming is starting to wake my baby. I have 2 babies with a similar age gap to yours and went through this exact same thing with my toddler and I also bought an OK to Wake clock at that time! It helped us a lot, but definitely took some patience on my part explaining it to him before he really “got it”. I also found that when the new baby came alone my toddler started pushing more boundaries with his sleep to get my attention so I had to find a balance of juggling life with two! So he may be adjusting to that as well and experiencing some FOMO (fear of missing out) like my son did. Thanks for using the Baby Sleep Site as a resource, and I hope you see a change soon! To take 2 naps anymore. Would love your ideas- thanks! I hope this smooths over soon for you! Thank you for using the Baby Sleep Site as a resource for sleep! Hi, I was wondering about my son who is 4. He wakes every morning at around 5:45. I know he is still tired because he is rubbing his eyes but refuses to go back to sleep. I even try and lay with him and tell him it’s not time because the sun on his clock has not come up yet. This has been the case for months, but he started school in September and I thought he would definitely sleep better since school, but that’s not the case. I even make sure he is in bed between 6:30-7:30. Why is he still waking so early? He has never been a good sleeper. Thank you. My 20 month old has been waking up around 4:45am every morning. He goes to bed at 7 on the dot and is very tired at that time. He takes one nap a day for about an hour, two max. Is this amount of sleep normal? My 10 month old has been an early riser for a while now and i dont know what to do to fix it. He sleeps through the night from 7pm but wakes up consistently between 5:15 and 5:45. He naps from 9-10ish and then from 1-2. Sometimes take a cat nap from 4:30-5. Should i eliminate the third nap? Or should i push his bedtime later? @Laura, Thank you for your question. Early risers can be quite a challenge, and I understand how hard this can be for everyone in the household! If your child is sleeping well through the night, and his only problem is early rising, then I would suggest looking at his naps. You could try to push the first nap to start at 10:00 a.m., and the second nap to begin at 2:00 p.m. You may find that this naturally pushes out the third nap, which may be causing the early wakings. I recommend taking a look at our 10 month schedule to see how you can align it with your son. Here is the link: https://www.babysleepsite.com/schedules/10-month-old-schedule/ Best of luck! Hello, I have a 10,5 months baby that just started childcare. He used to wake up at 6:30 and then have a nap at 10 am for around 2 hours and then at around 15h also almost 2 hours and then he would go to sleep at 20h. Since he started childcare they have been changing his habits and he sleeps now from around 12:15 to 14h and I have no idea when or if he should have a second nap. I am trying at the moment to make him have a second nap at 17h but then he has trouble to go to bed at 20h or even 21h and he still wakes up at 6:30 which I consider quite early. If I continue with the second nap and I put him to sleep at night at 21:30 can I try to make him sleep until 7:30? He wakes often during the night every 2h/2,5h but at 6:30 he normally doesn’t want to go back to sleep. The article will give you a few tips on how to adjust things on your end, and what to expect if your childcare provider is unable to accommodate your scheduling request. I hope this article gives you the information you are looking for. Best of luck! I dont know what our problem is, little guy is almost 18 months old and usually takes 2 naps. He has been sick last week and slept lots extra and we let him. Now, he is taking a morning nap fine but refuses afternoon nap. So then I try to have just one nap so his wake time isn’t 3 hours, then 7 or 8 hours. He is waking more at night and earlier and in the morning, isn’t going back to sleep very much. I have read all the articles on transitioning naps but can’t quite tell if he is ready. If I do a few days of 1 then try 2, he often just wont take the afternoon one then I am stuck with the 7 hour awake time. I understand it may be the regression or leftovers from his illness as well, I guess it just seems like i still don’t understand what to do. If advice is just wait it out then how do you help them in that meantime? Aren’t they getting crazy thrown off by it, or just lt them throw themselves all over (not literally, yet ha!). If we keep trying for 2 naps and he just refuses the second every day then do I just let him have a crazy long awake time or do I push to the 1 nap so it’s consistently a bit more even? (If it’s the regression). Hi there! I’m sorry to hear you’re having some trouble with the nap transition. The transition to one nap can be really tough and take a long time for many families, so you’re definitely not alone in it. As you mentioned, this transition can come on the heels of the 18 month sleep regression, which also can cause a big upset in your baby’s usual routines. Based on your description, it does sound like he’s probably ready to transition to one nap, and you can do that by basically pushing back his morning nap time 15-30 minutes every day or every other day until he is taking one midday nap. You may have to offer an earlier bedtime during the transition to offset the big awake time, and his schedule and night sleep will be “off” from anywhere from a few days to 2 weeks, but that can be normal, even though I know it can be frustrating. Thanks for reading and commenting, and good luck with everything! Help! My 9 month old nurses to fall asleep around 7:30/8pm most nights. She sleeps in her crib but wakes up at 10pm, 2am and 5am if not more often crying and won’t go back to sleep on her own. I’m at the end of my rope I’m so tired. @Kylie Oh no, I’m sorry to hear that your little girl wakes so frequently at night! It sounds as though she may have developed a sleep association that is keeping her from sleeping in longer stretches – possibly with feeding. The goal is to have her fall asleep at bedtime on her own with minimal support from you, and be able to fall back to sleep on her own when she wakes without feeling she needs help in order to be able to. This is a process that may take some time but if you stay consistent and committed to the process, you should see results! You may want to read this series of articles for tips on how to teach her the skills that she needs to be able to learn how to sleep on her own. It will also give you an overview of sleep training techniques: https://www.babysleepsite.com/sleep-training/sleep-training-from-no-cry-to-cry-series-part-1/ Once you’ve read this, you can see what type of sleep training (if any) you would like to try and then give it at least a week before making changes. I hope this helps – keep us posted and please keep reading! Hang in there, Kylie.